The most advanced padlock? The one-piece padlock made of special steel! There are special cases where it may be better to choose something else, like a marine padlock or one with a long shackle. There are cases where the level of security required cannot justify the cost. But if there are special needs and you can afford the price of a one-piece hardened, case-hardened and anti-corrosion treated steel padlock, this is definitely the most technologically advanced product in the field of mechanical padlocks. One-piece steel padlocks, such as the Viro Monolith, represent an development of the armoured padlocks. 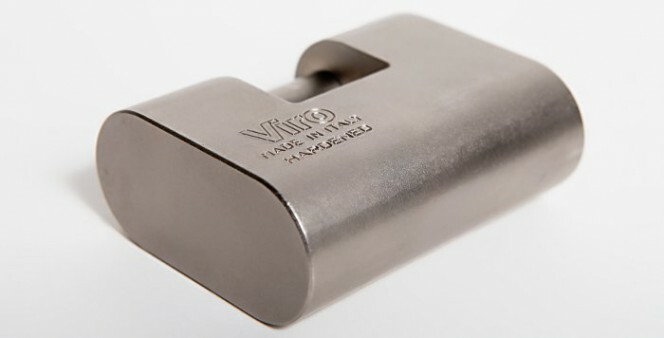 In this case we are not dealing with steel armour which protects a brass body, but the entire body made of special high-strength steel.The entire body of the Viro Monolith padlock, for example, is made of tempered and case-hardened steel to increase the mechanical strength and the surface is coated with a particular chemical nickel plating (Niploy Process) which makes it resistant to corrosion. The internal cylinder, which is fully protected by the body, is, on the other hand, made of brass, for maximum reliability, since its components (plug and pins) must continue to function over time, minimising friction on the keys, which are also made of nickel-plated brass. With the same external dimensions, the body of a one-piece padlock is larger than that of an armoured padlock which must enter inside the armour. For this reason, the one-piece body not only guarantees better mechanical resistance but also allows larger internal components to be housed. Starting from the lock-bolt, which may have a larger diameter, and therefore be more resistant to cutting, up to the anti-drill plate that can be rotational. The Viro Monolith has an lock-bolt with a diameter of 13 mm. Unlike a fixed plate, a rotating plate provides an active resistance to drilling, as it rotates together with the drill bit, preventing it from penetrating – as can be see in this test. 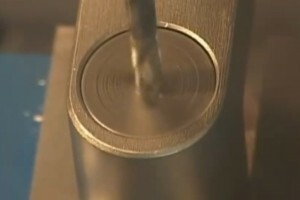 A rotating plate turns together with the drill bit, thereby preventing it from advancing. The body of some one-piece padlocks, such as the Viro Monolith, also allows the cylinder to be replaced if necessary. This is a useful operation when one wants to change the key or if the cylinder no longer works properly, for example due to an attempted burglary or due to wear and tear after many years of use. Given the value of a one-piece steel body, even the internal components must be of first class quality. 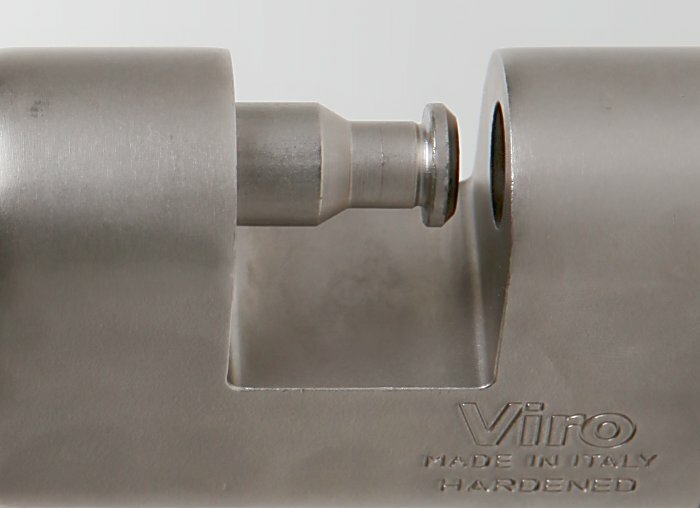 The springs, pins, counterpins and latch of the Viro Monolith are, for example, made of stainless steel instead of the plain steel, brass or bronze normally used, and they are therefore resistant to moisture, which, together with anti-corrosion treatment for the body, makes the Viro Monolith particularly weather-resistant and therefore also suitable for outdoor use. A one-piece steel padlock is, in short, a little gem of precision engineering, where each component is designed and manufactured without compromising on the quality of the materials and workmanship. It is definitely the right choice for whoever wants the best security that a padlock can offer. For chains: Totem, Thor and Eurothor. This entry was posted in Padlocks and tagged products, technology on 10 February 2014 by Mara Rossi. y?u are however certainly you’re going to a well-known blogger for tho?e wh?